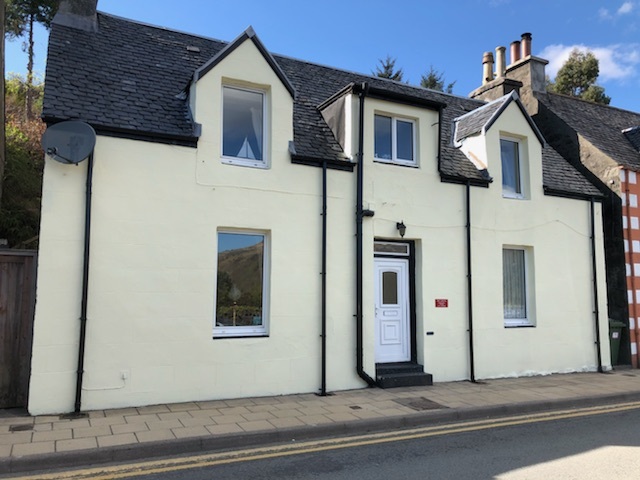 The cottage comfortably sleeps up to 5 (plus a cot) and has a toilet, sitting room, modern fitted kitchen including a dishwasher, and double bedroom on the ground floor. The upper floor has a bathroom and one double and one single bedroom. As well as central heating throughout the cottage the lounge has a multi-fuel burning stove. The cottage has wifi. The property is an ideal holiday venue for up to 5 guests. All of the prices below are fully inclusive of heating, electricity and all linens. Sorry no pets and no smoking. The period of let for seven night bookings is Sunday to Sunday. A non refundable deposit of 25% (minimum £100) is required at the time of booking and the remaining balance is payable 6 weeks prior to arrival. 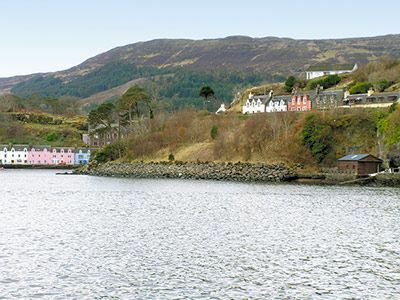 The cottage in an elevated position with panoramic views across Portree bay.